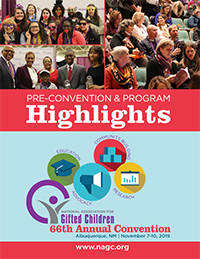 NAGC19 Proposal decisions will go out in early April. Listen to Giftedness Knows No Boundaries Podcast on Should Millions of Students Take a Gap Year? Javits-Frasier Scholar 2019 applications are now being accepted.